Polana Serena Hotel is one of Africa’s greatest hotels. 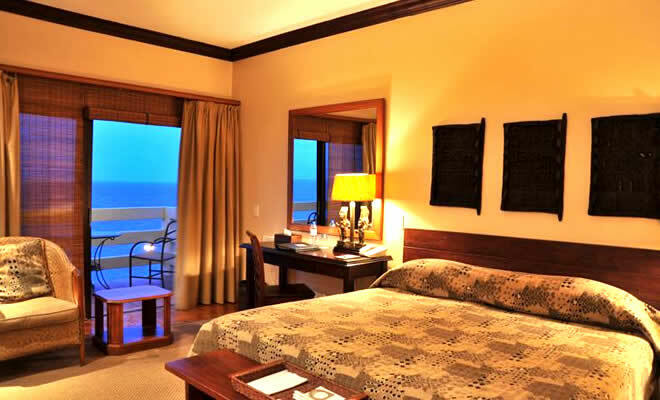 Known as the ‘Grand Dame’ of Africa, the hotel is located in one the most exclusive residential districts in Maputo, Mozambique. The hotel, in dedication to the local culture, architecture and heritage, undertook a massive renovation which gave it a look of a landmark historical building whose classic charm has been fused with the ultimate in world class amenities. Polana Serena Hotel boasts 142 rooms, the majority of which are suites and now also has 3 on site restaurants; the all day Varanda Restaurant, the Delagoa French fine dining and Aquarius sushi bar and there is the Polana Bar. The hotel also feature the ‘Maisha’ Mind Body and Spirit Health Club and Spa, a huge swimming pool, extensive gardens, and an exclusive residents’ lounge. There is also a business centre, a beauty salon and three gift shops. Being one of Maputo’s major business venues, the hotel also features its own conference and social events suite, which also features a magnificent ballroom. Polana Serena Hotel rooms are presented with refined elegance, and with lavish references to Mozambique’s Indo-Portuguese heritage. Rooms feature predominantly exotically carved furniture, juxtaposed with luxurious fabrics in muted tones of cream and off-white. Accommodation in the Polana Mar Wing, which are presented in an inspirational fusion of contemporary African design and authentically Portuguese style. Our guests also enjoy access to our private residents’ lounge, Maisha Health Club and Spa, business centre, hair and beauty salon, gift shops, travel desk and secure car-park.